This month’s Federal Budget provided $222 million to maintain the National School Chaplaincy Program for a further four years. Chaplaincy funding has proved to be one of the more controversial inclusions in this year’s Budget. That is because many state school parents don’t want their children exposed to religious proselytising, and no not trust chaplains not to proselytise. Their skepticism was vindicated recently with the revelation that the group Access Ministries has been using the program for proselytising, contrary to the its Guidelines and Code of Conduct. The Fairfax press reported that Access Ministries CEO Dr Evonne Paddison told participants at a 2008 Anglican conference that the program was a ‘God-given opportunity’ to evangelise, and that they needed to use it ‘to go and make disciples’. It is clear that Dr Paddison was encouraging conference participants to ignore item 9 in the Code of Conduct that chaplains are required to sign. Item 9 stipulates that ‘a chaplain should not take advantage of his or her privileged position to proselytise for [his or her own] denomination or religious belief’. However those who conceived the program must take some responsibility for abuses that occur because their default position – expressed in the program guidelines – is that the chaplain must be a minister of religion, or at least a person who believes they have a religious calling. At least in the context of Christianity, many ministers of religion understand that their role is precisely to proselytise, in the spirit of Jesus’ command to ‘proclaim the Gospel to all nations’. It is a minority of ministers who would have the training and the disposition necessary to exercise the degree of impartiality required for a chaplain’s role in a state school. Moreover it is unlikely that the majority would be sympathetic with the principles of modern missiology, which has the immediate aim of building understanding between different faiths and cultures, rather than winning converts. Such wisdom has much to offer institutions such as state schools, which recognise and celebrate a diversity of faiths. But the program’s guidelines are very vague and do not allude to such principles at all, thereby leaving room for fundamentalist approaches to religion. While at first glance the 25 page Guidelines booklet may in fact seem comprehensive, it contains only one paragraph specifying what the program is and what the chaplains are required to do. That’s all. It’s likely that a more thorough description of what the program is about could suggest a different type of candidate altogether. Rather than tapping the religious fervour that exists in Access Ministries and the like, the most successful chaplains might be individuals who have a broad knowledge of religion but do not have any interest in proselytising. They may be former ministers who have become agnostic in their own beliefs but still mentor young people coming to terms with their spiritual identity. But it appears such agnostic candidates – with no conflict of interest – would fail to meet the religious selection criteria as detailed in the Guidelines. However those from groups such as Access Ministries – who do have a conflict of interest – clearly meet the selection criteria. While originally a Howard Government initiative, the National School Chaplaincy Program could be another Pink Batts, in that it has not been thought through. It isn't that ACCESS meet the criteria, they hold an exclusive contract with the state. They are the preferred vendor and 10% of the NSCP goes to them for overhead. While the Roman Catholics pulled back from grabbing the NSCP money last time, this time the schools are gearing up to get as much as they can. As for focussing on ACCESS, all the chaplain employer groups are the same, they all evangelise and proselytise, that's why they are there. The real 'pink batt's side of this can be found in the lies told on the application forms and annual reports to DEEWR. If the Ombudsman ever checks the applications against what actually happened in the schools with the 'broad consultation' he would soon find that the Ulladulla school situation, where 20 parents decided for the entire school, was a high point in 'broad consultation'. This is not a 'scheme' it is a SCAM, and should be stopped while investigators examine the trail of lies and deceit that accompany the Howard-Rudd-Gillard support for 'official Christian recruiting' going on in our public schools. As an R.E teacher & Anglican Parish Priest I'm absolutely fed up with all the R.E/Chaplaincy bashing that's taken place in recent weeks.In my experience Chaplains are well recieved in the schools in which they operate & the school at which I teach R.E the principal is on record as being a supporter of the R.E programme & appreciates the contribution we make to the life of the school community. He has further suggested that if the school had the money it would employ a Chaplain.Meanwhile,our local school Chaplain has been asked to speak to other schools in the area that have expressed interest in employing a Chaplain. And while I acknowledge that Access Ministries may not have helped it's cause at times I thought Eureka Street may have been a tad more supportive of what I believe to be a worthwhile & much appreciated initiative. I strongly support John Fowler's comments.Here in WA the chool chaplains have (after a few early hiccups several decades ago) been very well received and strongly supported by all denominations. "Witness" is quite different from proselytising. I could not agree more. It is a wonderful idea, wasted! The tragedy of it is that there are many young people who could benefit from the comfort of a good chaplain - not trying to introduce them to fundamentalist religion, but to care for their wellbeing. Years ago, when I was parish priest in Sydney, we had a high school programme common to all the mainstream Christian churches. We had a seminar once a term in place of the half an hour a week allowed. One of the seminars was given by a group who pretended to be Christian. It was a hellfire approach to religion, and horrified those of us there who thought we were doing something worthwhile! Isn't it time someone pointed out that Access comes out of Sydney and the conservative Evangelicalism of the Anglican Diocese in Sydney? Sydney is an anomaly in the Anglican Church and the majority of Anglicans look at Access with the same dismay. Sydney Diocese does not represent the common view of Anglicanism, either in Australia or anywhere, which is why it is not surprising that the chaplain of Melbourne Grammar School and the Vicar of St Mary's North Melbourne have made public statements in the past few days against this way of teaching religion in schools. Most chaplains do not proselytise and the misrepresentation of their work in this public debate is a scandal. It is the schools themselves that want more chaplains, a main reason being they serve as conflict-solvers and counsellors for the students, a role that is of critical importance to social harmony in our schools. Access is the object of attack for critics of religious teaching, whereby everyone else must suffer. I am in full agreement with Michael on this one. It is inconceivable that most priests and ministers could avoid doing that for which they were trained and to which they are committed. And that was clearly the intention of the Howard government's legislation - why else would would it call them 'chaplains' and require them to have religious qualifications if the role of chaplains was to be purely secular. The Commonwealth government funds programs in Indonesia that try to offset the adverse effects of pushing religion in schools in that country, and yet we encourage the same sort of situation at home. It's disappointing to see a throwaway line about the pink batts in this article. For the record, the numbers of accidents are about the same for homes insulated before the Home Insulation Program as during the HI Program. Problem is, it hasn't been reported correctly by the main stream media for reasons best known to themselves, although one could take an educated guess. The same applies to the results on the BER, not that anyone has checked the details of the Reports. Apologies for the distraction, but I'm heartily sick of the mis-representations being endlessly repeated. After seeing the video of the Access Ministries speaker, they should be investigated given that they hold an exclusive contract. Yes, Michael, one of the major issues is quality control and quality assurance. We are assured that the 'vast majority' of teachers abide by the principles. Such an assertion raises two questions. First, by what quality assurance procedures is this known to be true? Second, what procedures are in place to identity and alter the behaviours of those who unlike the 'vast majority' do not abide by the rules? Michael: You're adding to the general confusion by not making a distinction between chaplains and R.E teachers. Two quite distinct roles, one professional and usually salaried, the other voluntary. The former is defined as education about the major forms of religious thought. The second, SRI, is an optional program defined as instruction provided by churches and other religious groups and based on distinctive religious tenets and beliefs. The third aspect is the chaplaincy program. ACCESS Ministries is the accrediting body for instructors of SRI (called Christian Religious Education by ACCESS) as well as for Chaplains. The ACCESS website contains a six-page CRE Overview for Parents of SRI which is very explicit about the fact that children will be taught such things as that God exists, that we can talk to and listen to Jesus, that the Easter events were part of God’s plan etc. If time permitted, a more detailed response would be indicated but suffice it to say that the issue is clouded by misinformation: apparently willful on the part of some and not so on the part of many. Congratulations on a good article. The chaplaincy program has the potential to do a lot of good in schools. But I totally agree that it has not been thought through properly. In a review of the program some time back the government interviewers were given this advice. It is so frustrating to see such potentially good resources so poorly used. ACCESS Ministries is * one of * the accrediting bodies for instructors of SRI (called Christian Religious Education by ACCESS) as well as for Chaplains. Chris M seems to have missed the nail and hit his thumb. Fact or Fiction !. They are not facts and to be taught as facts is a lie. Go on prove it, if you can then you will be the very first person in the world to do that. Dear God!, if you'll excuse the exclamation. The comments here show a total disregard for what is happening in the schools, and a lack of understanding as to the real role of the NSCP funding here. Will you all be quite so supportive if our state schools were being flooded with Imams and Jewish Holy Men, with Buddhist priests and 'Green activists'? It looks as if you all have an unhealthy self-interest in evangelising in state schools because 'you' happen to believe that your 'product' is worthwhile. Maybe it is, but why should you have any right to be flogging it for all you're worth in what should be a fairly neutral space? State schools are not there so you can all go in and flog your religious ideology you know. Chaplains as used in the NSCP scheme are flimsy excuses with little or no training in anything other than basic crude evangelism, and even if they are 'trained counsellors' do go and read the NT Ombudsman's report on the abject mishandling of the NSCP in the NT. She makes the point that NSCP chaplains are not employed to counsel, just to be a low grade Jesus spruiker, and that is what they should stick to. Thanks Michael. Keep it up. RE at school has been notoriously boring and even demeaning of Christianity for generations. If the little I have seen of AM's curiculum, that is, cartoons and snippets, not much has changed. Has anyone gone to the school yard to seek the kids response? What would happen to AM if RE/RI was an opt-in subject? 1. Christian RE/RI to be found in Church Sunday School's. And, 2. for education about religions to be found in a philosophy/ethics course taught by professionals in the high school curriculum? "In my experience Chaplains are well received [sic] in the schools in which they operate…” - Harry Wilson It does not matter how well they are received, or the good work many decent chaplains may do in public schools. They are often hired on the basis of their religious beliefs which is discriminatory. Furthermore, we have numerous examples of chaplains over stepping the boundaries and proselytising to children. Given the religious beliefs of many people, this cannot be helped. “He [the Principle] has further suggested that if the school had the money it would employ a Chaplain"” - Harry Wilson Thus violating Section 116 of the Australian Constitution, unless there is no requirement for the person to be religious, but then why call them a chaplain? I find it difficult to see how a Christian program such as Access provides can be other than proselytizing, i.e. teaching children the desirability of being Christians. That would seem implicit at some level in funding a Christian organisation to provide the program. As a Christian, I see that as not necessarily a bad thing, but as a citizen in a culturally and religiously diverse society I don't see such a government-funded program in a State school as right. I would argue though that an essential part of any school's curriculum should be general religious education about the place of religious beliefs generally in seeking answers to the meaning of life and how that informs how we should live. It is for the children guided by their parents to seek specific religious education outside a set government school curriculum. 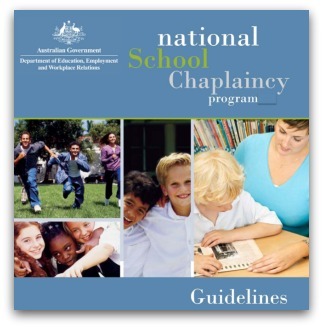 The National School Chaplaincy Program is not only a waste of $222 million it is highly immoral. In diverse communities such as ours a comparative religion/ethics course also has global educational value. If we were a 100% fundamentalist Christian community it would still be brainwashing, and the money could be better spent elsewhere. "It is the schools themselves that want more chaplains, a main reason being they serve as conflict-solvers and counsellors for the students, a role that is of critical importance to social harmony in our schools." I think that's right. But conflict-solving and counselling should be done by people qualified to do that - not people with religious training. If a young person thinks that they are gay, for example, and wants to talk to a trusted adult, but not a parent or teacher, they should not be steered into the hands of religious fundamentalists, but properly trained professionals. Read again Skeggie, you put my name in against words not written by me. Apology accepted, but don't do it again, please. Dear Russell, very often the chaplains and religious educators we are talking about here are precisely conflict-solvers and counsellors for the students. In fact, they are trained many of them for this work. The black-and-white nature of much of this debate comes from contributors with a very narrow understanding of religion and so-called religious people. Most of the chaplains I know are amongst the most highly educated and knowledgeable people in our community. The accusation that they are not qualified or appropriate people to do this work is meaningless. They are the very people we need to help our students. Religious training, as you put it, is not a restriction from also being a professional psychotherapist, conflict manager, or teenage counsellor. These things are not mutually exclusive. I agree when you say that a young person who thinks that they are gay, for example, and wants to talk to a trusted adult, but not a parent or teacher, should not be steered into the hands of religious fundamentalists. But since when were most chaplains and religious teachers in schools, religious fundamentalists? You have though identified the real issue here, which is how to tell the difference between religious fundamentalism and religion. This debate is black-and-white because many of the critics of religious education equate religion with fundamentalism. This is a very serious error and leads to misrepresentations of chaplains &c. as well as putting off-side the very people who are here to help. The best way to start learning the difference between religion and fundamentalism is to be taught correctly in school by a religious teacher who can show you the difference. Sincerely, Sydney Melbourne. I had the experience of 12 years of religious schooling and I can thank the Marist Brothers for showing me what religious education isn't. Of course school chaplains could be qualified in relevant areas, but the point is that those qualifications are not the ones required for the position of school chaplain. I want counsellors in schools to be qualified child psychologists with counselling training. They may also be religious - who would know or care - but inviting people into schools on the basis that they are 'religious' ensures that some, at least, of them will think that religion is why they are there. I called them fundamentalists according to my own criteria - people who put ideology before humanity ... I encountered many of them during my time in the Church. Thanks Russell. Your definition of fundamentalist is a good one, it is certainly a good way of talking about the problems that any fundamentalism creates, be it religious, political, scientific, nationalist. My experience of religious education is very different from yours. It was creative right from the word go and, I see now, inclusive of difference while grounded in the gospel. I guess we each argue from our own experience. For me, there is what works and there is what no longer works, but I couldn't know that without my education in religion. Thanks for your honest response to my words. I agree with your definition of fundamentalism, and therefore see fundamentalists as misusers and ideologues of Scripture. "support and guidance about ethics, values, relationships, spirituality and religious issues; the provision of pastoral care; and enhancing engagement with the broader community"
Sounds like a job for a secular counsellor to me! Harry Wilson wonders how concerned we'd be if Chaplaincy roles were taken up by non-Christian people - Muslims, Hindus, Buddhists. I can tell Harry that the Buddhists would probably propose that students consider the Five Precepts of Buddhism. - I undertake to not kill. - I undertake to not steal. - I undertake to not lie. - I undertake to not engage in sexual misconduct. and (so far, one might think this is a stripped-down, non-theistic subset of the Ten Commandments). - I undertake to not overindulge in intoxicating substances. Perhaps comparative religious studies in State schools would be of general benefit. Who are all these secular counsellors who are so very much better at counselling than non-secular counsellors? Are they really any better? How do you qualify to be secular? Can you define secular for me please. Is there a government department definition of this infinitely superior and preferable person, a secular? And what exactly is a secular counsellor going to teach children? And do parents want this unknown quantity being taught to their children? Wouldn't a complete education necessarily mean knowing everything about what is secular and what is non-secular, religious and non-religious (whatever that is)? And what about all the millions of religious Australian people who are also secular? Where do they fit in here? Go figure! In England Religious Instruction and allied subjects have always been taught by school staff. nowadays when the general population is post christian the syllabus has been extended to include subjects like philosophy, ethics, logic etc agreed to by the main religious bodies, which were all included in education before the 19th century. Unfortunately in the 19th century in Australia with the sectarian controversies of the time government authorities decided that all education in public schools should be "Secular". In practise this has meant "Godless" so "religion" in contrast to morality and ethics is regarded as a spare time hobby. Government schools have been loath to become involved in life issues including health and "wellbeing". Unfortunately when it comes to drug and similar issues the public look to "Law and order" for solutions not our Christian heritage which is generally positive. While a key element of Christian ministry is to proclaim the gospel to all nations, I think that chaplains are able to recognize that state school chaplaincy is primarily an exercise of pastoral care. In the Western Australian context that is certainly the emphasis. While it can still be appropriate for a chaplain to share their understanding and experience of faith if asked, I am sure the emphasis is on building healthy inter-personal relationships and helping individuals and groups develop a positive sense of self-esteem, respecting the wide diversity of religious or non-religious identity of the students and staff. The welcome that a wide range of secondary and primary state schools now extend to chaplains in WA has grown out a background of generous care and involvement that the churches have self-funded to provide part time chaplaincies over many years. It is out of a recognition that appropriate boundaries have been respected, whilst also providing a generous, caring support service, that community members, state and now federal funds are to various degrees being provided to extend and maintain this high quality and professional care that complements other secular student services. I think the most disturbing aspect of the NSCP is its Orwellian imposition on children who attend public schools. From the point of view of the children themselves, in what sense is the NSCP voluntary? On Monday evening, Four Corners viewers reeled at images of Australian cattle being slaughtered in Indonesia. Since Indonesians are predominantly Muslim, perhaps an appeal to change their inhumane practices can begin with an appeal to the concept of halal: that which is permissible under Islamic law. The Government's free set-top box scheme is facing community and Opposition claims that it is wasteful and will tempt rorters and shysters. What should be a feel-good scheme has become a cavalcade of the disgruntled. This tells us a lot about politics and policy-making.